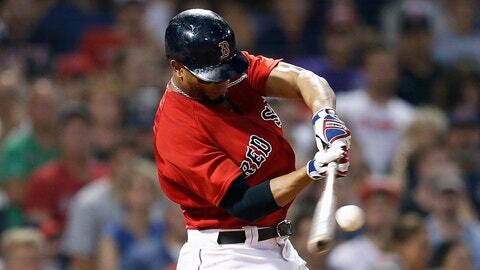 BOSTON (AP) — An early stumble did little to slow down the Boston Red Sox. Boston scored seven straight runs after falling behind 3-0 in the first and beat the Tampa Bay Rays 7-3 on Friday night. “We had a good night. Guys put in quality at-bats from the first hitter on,” said Xander Bogaerts, who led the latest rally for the Red Sox with a two-run triple in the first. Bogaerts added a pair of doubles and the Red Sox improved to 51 games above .500 at 87-36. Jackie Bradley Jr. had two hits, including an RBI double in the sixth, and the Red Sox won for the sixth time in seven games. Brian Johnson recovered after getting roughed up in the first, when the Rays tagged him for three runs on four hits and a walk. Johnson cruised through the next three innings and didn’t allow another run. Johnson (4-3) pitched 5 2/3 innings before leaving after Joey Wendle’s double in the sixth — Tampa Bay’s first hit since the first inning. Wendle drove in two runs with a double in the first and Carlos Gomez had an RBI single for the Rays. Yonny Chirinos (1-5) took over for Ryne Stanek in the second inning and allowed five runs on nine hits over six innings. Bogaerts pulled Boston within 3-2 on a two-out triple to center in the first, then led off the fourth with a double. Eduardo Nunez drove him in with a single to tie it at 3-all. Bogaerts, who fouled a ball hard off his left shin before doubling again in the seventh, has driven in nine runs in his last eight games. “He put some great at-bats today and that was good to see,” manager Alex Cora said. The Red Sox added another run after Mookie Betts’ leadoff double in the fifth and a one-out single by Mitch Moreland, who finished 2 for 4. Mallex Smith had a pair of hits for the Rays and a made a great catch in the second on a sinking ball hit by Nunez, running it down in shallow right just before crashing hard into the wall with his left hip. Smith held on to the ball despite tumbling into the front row and remained in the game after a quick visit from the trainer. “Really impressive play,” Cash said. In the third, Bradley made a catch for Boston that rivaled Smith’s play the previous inning. Tommy Pham hit a deep fly ball that was headed for the wall in left-center until Bradley ran it down just in front of the 379-foot mark for the second out of the inning. Bradley had to lunge to get the ball and crashed to the warning track and rolled, avoiding a full-speed collision with the wall. Johnson walked Pham with two outs in the first before C.J. Cron and Wendle hit consecutive doubles and Gomez singled to drive in Wendle for a 3-0 lead. Johnson said his first-inning struggles had mostly to do with struggling to locate with his curveball. Rays: LHP Vidal Nuno (strained right hamstring) was scheduled to pitch two innings for Class A Charlotte on Friday night. Nuno has been on the DL since July 4. Red Sox: Activated Ian Kinsler (strained left hamstring) from the 10-day DL and started him at second. Placed 3B Rafael Devers on the 10-day DL with a strained left hamstring, retroactive to Thursday. Rays: RHP Tyler Glasnow (1-2, 3.97 ERA) gets his fourth start for the Rays since arriving from Pittsburgh in the Chris Archer trade July 31. Red Sox: LHP David Price (12-6, 3.75) has allowed a total three runs over his last four starts, going 2-0 with two no-decisions.